In other circumstances this wouldn’t be a problem worth mentioning, but unfortunately these aren’t other circumstances. Late on Saturday evening we had an email from the son of our farmer neighbour in Wales, telling us that his elderly and chronically-ill father had died peacefully in his sleep and that the funeral would be this Thursday. We have been friends and neighbours for over 40 years, ever since DH and I moved into our shabby old farmhouse as a couple in our twenties with two small children. Our neighbour was then in his late forties, a busy, hard-working dairy farmer, but never too busy to lend a helping hand when we needed one. He and his son sank a new well for us when the old one proved insufficient for our needs, all for just the cost of the materials. Until the regulations changed and milk had to be stored in sealed tanks until collected, we bought all our milk from their farm. I have such vivid memories of watching him or his wife ladle totally fresh and un-homogenised milk into our one-gallon carrying churn, knowing that the cream would rise to the top and be able to be scooped-off to be poured over puddings. Those were the days. Since the news arrived we’ve had three days of chaos – packing the van, saying our goodbyes, moving furniture ready for the carpet-laying, even cancelling my birthday present order from Amazon, since I won’t be here to receive it. If the fitter doesn’t turn up we’ll have to leave the furniture where it is and get the carpet fitted on our next visit. For some things are far more important than a bit of chaos or a delayed new carpet or the loss of the last few weeks of our visit. Saying goodbye to someone we've known, liked and respected since we met him nearly 41 years ago is essential – so this evening, come what may, we’ll be heading south. Update at tea-time: The carpet is being swiftly and expertly laid and an early evening departure is now a certainty. One of the joys of church-going up here on the north coast of Scotland is the sheer beauty that surrounds me on the way to and from every service. As I've mentioned before, the church buildings I've known and loved in my life all matter hugely to me, but here the journey to worship itself can be as unique and awe-inspiring as any beautiful and ancient building. I think a bit of background is probably needed to begin with, to show just why Holy Week and Easter here are so busy and yet so very special for me. The history of church life in Scotland since the reformation is very different from that south of the border. Here the parish churches found in every town and village belong to the Church of Scotland, which is Presbyterian. 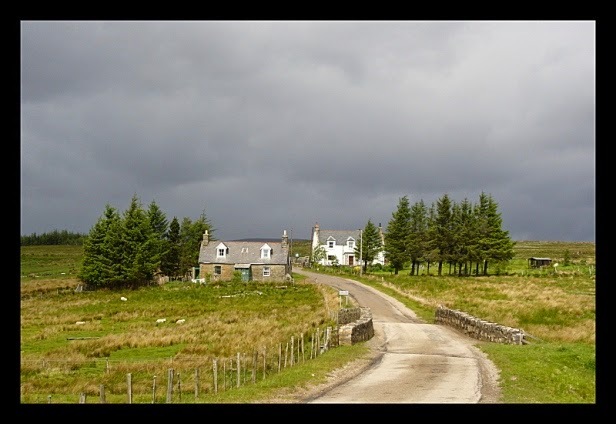 Anglicans such as myself are always made very welcome at their services, but if I want to attend worship in my own tradition, I have to find a congregation of the Scottish Episcopal Church and these are few and far between in this remote and sparsely-populated area. Two years ago a new Episcopal congregation was inaugurated here in Tongue and we meet once a month on a Friday at a local retreat house, almost in the shadow of Ben Loyal, for a Eucharist followed by a very enjoyable shared lunch. People travel from a wide area to get here, with only a minority of people actually living in the immediate locality, and they need to be fed and watered before they make the journey home. 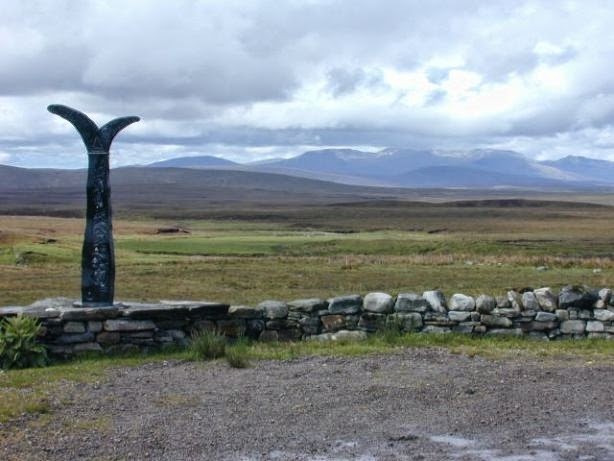 We are part of what is known as the Northwest Charge, which covers the whole of the top left corner of the Highlands as far south as Ullapool. Our Rector lives 60 miles away and has 5 very scattered congregations in his care. I hate to think what his monthly mileage total must be! If we want to attend a Eucharist more than once a month, we too have to be prepared to travel. 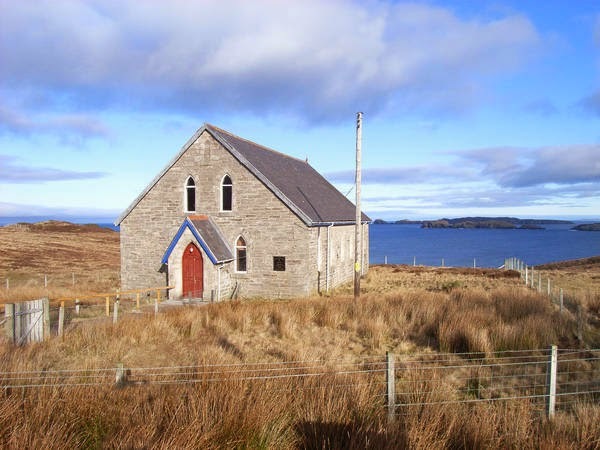 Holy Week began of course with Palm Sunday and the Church of Scotland parish service was held across the Kyle on the Melness peninsula, in the most northerly church building on the British mainland. Later in the week, on Maundy Thursday I went with 3 friends to an Episcopal Eucharist being held in one of the most unusual places of worship I’ve ever experienced. 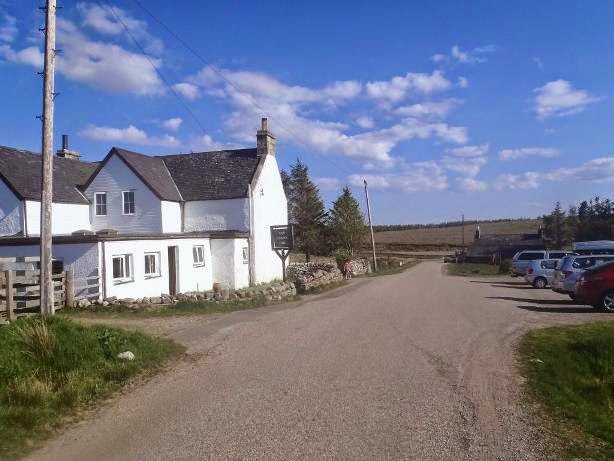 Once a month on a Thursday at mid-day, people gather from across an apparently empty landscape at the Crask Inn, about 20 miles south of here, and one of the most remote hostelries in the British Isles. As in Tongue, the service is followed by a shared lunch and the chance for a good chat to catch up with everyone’s news. Sadly the weather that day was so bad, with strong gales and driving sleet, that none of the photos in this section were taken by me. However the service was so moving that the battle against the elements faded into complete insignificance and only the experience of worship remains. Thankfully that was the last kick of winter and Good Friday dawned bright and sunny, as did the rest of the Easter weekend. On Easter Day I walked happily along the road, under a totally cloudless sky, to the parish church for a packed and joyful morning service. Later that day, still in glorious sunshine, I drove with the same three friends along 50 miles of mainly single-track road across the hills and around the coast to the council day centre in the little fishing port of Kinlochbervie to make my Easter communion at a wonderful service, which was followed by an equally wonderful Highland tea. The drive home at sunset, with tendrils of mist beginning to curl up from the surface of the lochs, and the deer coming down from the hills to the water to drink, was so beautiful that it brought me close to tears at times. Yesterday a very special Easter celebration was rounded off by our monthly Eucharist at the retreat house. The sun may have disappeared behind a layer of thick, grey cloud, but nothing dims the warmth of the fellowship we enjoy and the significance we attach to the worship we travel so far to attend. And there isn't a pew or a stained-glass window to be seen anywhere…. Jesus Christ is risen today. Alleluia! 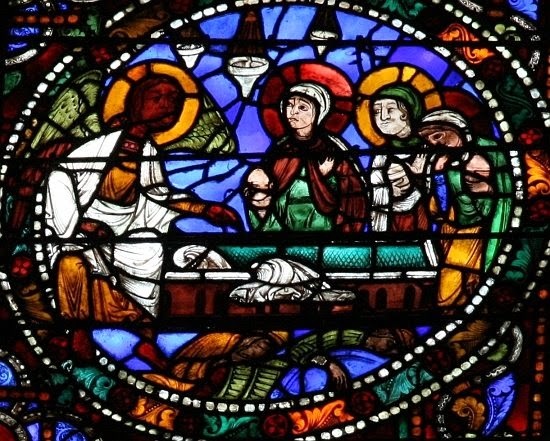 Hymn: Words: Compleat Psalmodist, 1749, based on a 14th century Latin carol, "Surrexit Christus hodie"
Image via Google: Women at the Empty Tomb: detail from stained glass window in Chartres Cathedral, c. 1150. 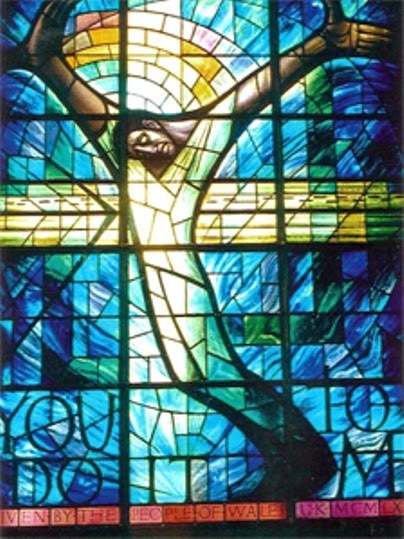 Image: Memorial window in the 16th Street Baptist Church, Birmingham, Alabama, to the children killed in the 1963 bombing of the church. Given by the people of Wales. Details here. Given the slippery nature of time I shouldn’t be surprised to realise that it’s already more than two weeks since we arrived up here in the North-West Highlands after a most enjoyable 90th birthday celebration weekend for DH’s mother, which I haven’t even mentioned yet. We assembled on the Friday afternoon at the home of DH’s youngest brother in Southport for an evening of family chatter before the big day itself. At 90 one doesn’t want to spend the day too strenuously before one’s birthday dinner in a local hotel, so it was decided we would go out in the afternoon for a gentle stroll around a local historic property, Rufford Old Hall, near Ormskirk. Rufford Old Hall was owned by the Hesketh family for some 500 years until it was handed over to the tender care of the National Trust in 1936. The original building, which dates from around 1530, was a late mediaeval hall-house, though now only the Great Hall survives. Its elaborate and highly decorative half-timbering is both beautiful and impressive, though I couldn't help thinking how many oak trees it must have taken to build it. In 1661/2 a new wing was built at right angles to the original hall which, being brick-built in Jacobean style, contrasts very clearly with the hall’s black and white timbering. The house was further extended in the 1820s to give the building we see today. A touch of extra glamour is given to the house by the possibility that the young William Shakespeare himself may have acted in the Great Hall in the early 1580s when he was working as an assistant teacher in the household of a local landowner. And this is meant to be movable? The house is surrounded on three sides by formal gardens and on the fourth by a branch of the Leeds to Liverpool canal, giving it an air of great tranquillity and timelessness and a feeling of being very far from the hustle and bustle of modern life. We thoroughly enjoyed our tour through four centuries of English domestic architecture and came home very ready to relax with tea and birthday cake before sprucing ourselves up for our evening out. Sadly, the sunshine we enjoyed that afternoon didn’t last and our journey up through Scotland on Mothering Sunday was notable for the mist and murk which conspired to hide even the grandest of the mountains we drove through. That’s Scottish weather for you! Despite the ever-lengthening daylight, there just aren’t enough hours in my day. Since our arrival on the north coast just over a week ago and very late at night, I’ve barely stopped. The first couple of days were spent unpacking and recovering from the long, tiring journey and then the social whirl started with my first visit to Knit and Natter last Wednesday morning. Since then I’ve been out for much of the day every day except Thursday and my first free day this week is Friday. I have a post simmering gently on the back burner, but there are a lot of photos to be gone through and worked on and background information to research, so it will have to wait until I can step off the merry-go-round. Music practice takes up a chunk of every day and I’m busy keeping my promise to catch up with your blogs, which I’ve sadly neglected in recent weeks. I can hardly expect you to take the trouble to read and comment on my blog if I never return the compliment. So to keep you entertained until my mad frenzy settles down again and I too stop chasing around for a bit, here’s the latest, and very appropriate, escapade of Simon’s Cat.